You have to imagine this… You arrive at Il Valico, perhaps feeling tired and a little jangly from the flight and the drive in from Nice airport, and perhaps wondering what you will find here…And then the incomparable Jeannette welcomes you and shows you in and escorts you from room to room, sharing all essential information for your stay. You admire the well-appointed kitchen and its whitewashed stone walls; the verandah with its floor-to-ceiling books on one side, floor-to-ceiling windows on the other; the fine bedrooms and dining room, and the many thoughtful touches throughout. At last, a step out from the dining room onto the terrace, and your view, your vista dalla terrazza, opens out over the blue and pellucid Mediterranean, and out to the dramatic Ligurian Alps with Menton below, and your last bit of stress leaves you as you breathe a happy sigh. This is what you had dreamed of, back in January with the sleet rattling against the window of your study. And with the next day, even though you have many plans for the area – hill towns to visit, the Hanbury Gardens, the Jean Cocteau Museum, pilgrimages to art sites of Vence, Saint-Paul-de-Vence, and Antibes – well, you might simply take one or two days here, and simply be. You will delight in the sunrise (on special days you can see Corsica on the far horizon, so promises Jeannette), the leisurely breakfast and coffee, or afternoon tea, or dinner (still on the terrace!) with the lights of Menton winking in the gloaming. Il dolce far niente. Tomorrow, or perhaps the day after, you will start your expeditions – but today, you will discover surprises, the soft and scented air, the books, the art, the terraced gardens stepping down and down, with their lemon trees, and grape vines, and persimmons – and you will greet the gardener who will smile and admire the view with you and with a sweep of his arm pronounce it fantastico. That, at least, was our experience! And we are so very grateful to Julia for our stay, and to Jeannette for her warm welcome and transportation and advice, and to Veronique for the housekeeping – How beautiful, Il Valico! How our memories will warm us in the January to come!  We have truly wonderful memories of our stay at Il Valico and the surrounding area. As I wrote to you when we first arrived, we were completely blown away with the garden apartment. It ticked all the boxes - the location perched over the sea, the classic presence, the amenities, the magnificent views and so on. The surroundings, including Menton and Ventimiglia, are also very special. We had wonderful visits to some of the local gardens, Hanbury being our absolute favourite, museums and other noteworthy sites. While we enjoyed running around and taking it all in, the special part was always going back to the apartment, sitting on the verandah, hearing nothing but the birds and enjoying the spectacular views from every vantage point. My wife and I both got the flu bug but that didn’t stop us from getting out there. Jeannette is such a nice person, always ready to help and always smiling and energized and she added to the positive experience. We will definitely recommend Il Valico to our friends with the one proviso, that they do not compete with us for booking when we want to return! I spent four weeks during March 2018 at Julia’s very special villa in Grimaldi. It was a wonderful month of relaxation and contemplation. I also got in a lot of exercise. First of all the location could not have been better for what I wanted, high on a hillside above the Mediterranean Sea, away from the traffic and commerce of busy lives. Everything for a comfortable get-away is available. A special feeling immediately hit me once I walked through the little town and entered Julia’s home. I have long admired stonework (have built a small stone tower myself) so being in a town like Grimaldi and living in this villa was something I marveled at every day. This type of “old-world” charm is difficult to find in America. The villa, with its stone walls and steps covered in flowering plants is beautifully nestled into the steep hillside. The extensive terraced gardens cascading down the hillside hundreds of feet below are impressive and also allow unhindered views of the sea and the French Riviera to the south and west. Just stepping out of the dining room onto the large classic terrace to enjoy coffee became my ritual each morning, and usually in early evening as well (with a nice Italian wine substituted for the coffee). I enjoyed many hours of reading and writing out there, as well as in several other of the beautiful comfortable rooms in the villa. Comfortable beds in the bedrooms, the well-appointed bathrooms and showers, the laundry room and a kitchen with every necessary utensil made living here for a month just like being at home in Vermont. And I can’t forget to mention the library, filled with an eclectic mix of travel, language, biographical, historical, art, and other books as well as novels from a surprisingly diverse selection of time periods, genre, and writers. This library, with the large screen TV and many English language channels also at my disposal, was a wonderfully comfortable seclusion during periods of especially rainy weather. I felt very spoiled to be able to watch birds feeding in the garden, hear peepers and insects harmonizing amongst the plants and trees, enjoy the blue sea sparkle across the entire southern horizon, and to gaze at the lights of Menton, France and beyond to Monte Carlo in the early evenings as the sun sank below the mountains of the coast to the west. All from within or without the comfort of this classic villa with wide expanses of windows in every south facing room. Though I am getting up in age, I enjoy cycling, hiking, and being physically active, so it was not a problem for me that I did not rent a car, which to me would have been more of a burden to maintain and park as well as an adventure to maneuver through the narrow street that runs through Grimaldi. Instead, I walked almost daily down to the coast and to the train station at Menton Garavan (3 miles) from which I was able to very cheaply take trains on numerous short adventure trips to the many interesting towns and places within 50 kms of Grimaldi along the coast. I shopped for groceries and sought adventures in both France and Italy, wanting to give both countries my attention. I cycled and hiked several day-trips along the coast on converted rail trail from Ospedaletti to San Lorenzo and on a hiking path around Cap Martin to Monaco. I would advise however, for families, or those less inclined to long walks, it would be helpful to rent a small car to make the daily transitions from this paradise hide-away above the sea, down to the hustle and bustle of life in the faster lane. The weather in March was a little less spring-like than I had envisioned, but it was not too cold or too wet for very long, and at least half the days were sunny and bright. Regardless of the periodic days of rainy weather, I felt perfectly comfortable in Il Valico during the entire month. When it rained, it was usually a light rain, which I ignored. I was not hindered much by the cool temperatures which I prefer. I left the villa after breakfast most days and made my excursions on foot down a spectacular road through a picturesque village, past soon familiar homes with everyday Italians starting about their daily life. Everyone I encountered was friendly and the walk gave me a chance to soak in the incredible views of the Riviera spread out below me. Particularly enjoyable day-trips for me were my visits to Balzi Rossi, the pre-historic cave site below Grimaldi and the medieval town of Dolceacqua a few kilometers to the east after a short local bus ride from Ventimiglia. All in all I was happy to be in this part of the world when it was not the high tourist season. Spring along the Riviera appealed to me because it was not too hot. On my next visit I might decide to return one month later in April in order to experience more of the early spring flowering that was somewhat delayed I believe by the unusually cool weather in March 2018. I have to say that once I arrived in Grimaldi, some earlier travel difficulties I had experienced were quickly forgotten and I had a stress-free month in paradise. Julia takes great care in making available all important logistical information about your visit. She remained available through email contact and her local manager Jeannette and her housekeeper Veronique both were so friendly and helpful it was painless to just settle in without a worry and enjoy this lovely place. If at all possible for me, I would certainly love to return again in the coming years. Our stay could not have been more perfect. The house has a feeling of a well-loved home that has been cherished by many. The view from the balcony! The library, the kitchen, the comfortable beds — all made for a feeling of home...the home of dreams. Thank you so much to Jeannette and Veronique for their many kindnesses. And thank you Julia for sharing your paradise. Il Valico is a little bit of paradise on earth. The sights from that balcony overlooking the Med and the wonderful town of Menton will be seared on your retina for months to come. The apartment is sublime, one of the most relaxing we have ever stayed in, and the multi-tiered garden laden with lime, lemon, persimmon trees and grapevines is gorgeous. It was something special to pick grapes and bring them straight to the plate for dinner on the patio as we gazed out over the sea. Special mention for Jeannette who came out in the middle of a sudden monsoon to let us in and show us around. Our family loved every moment we spent in this idyllic spot. The situation is spectacular — nothing could be lovelier than breakfast or supper on the elegant terrace with its view over the French coast and out to sea — and the flat itself very comfortably and elegantly appointed. Our teenaged children loved having their own separate studio; the beautiful garden full of scented flowers and ripening lemons was a balm in itself; the library made us want to stay for months and simply read. We ventured from Grimaldi inland into the mountains (to Breil sur Royat), as far along the Italian coast as San Remo, and along the French coast from Menton to Nice — a week wasn’t long enough. One of our favorite discoveries was the beautiful Hanbury Gardens, just a few kilometers away in Mortola. Julia, a wonderful hostess, has anticipated her guests’ every need or question. We can’t wait to return. We had a wonderful week at Il Valico in early June. It was all magical. The views are truly breathtaking, and we even had a full moon over the water! The house is charming, and the scent of jasmine wafting in through the windows from the pretty terraced garden was very heady and memorable. It was tempting to stay in and just enjoy the privileged setting, but there is so much to explore in the area (plenty of advice on this in the house). Do heed the warnings about car size: our Corsa only just squeezed through the tunnels in the village. Nestled in the hills of Italy, this beautiful house is comfortable, warm and inviting with stunning views of the Côte d'Azur. Spotlessly clean with all amenities including a small kitchen which is fully equipped with utensils, dish washer and large refrigerator. Hair dryers in every room and air conditioning/heating. There are a number of stairs within the house which is to be expected as the house is built on a hillside. So not suitable for those who need flat spaces. Lemons and grapefruits hang from the trees in the garden which is filled with flowers. A great location for touring the South east coast of France and the hilltop and fishing villages of Italy. Rent a small car as the road is narrow and there are a couple of tight arches to go through. Julia has a small car at the house to rent. Superb hiking, challenging cycling and bird watching in the national forests which climb up from the coast. Cultural activities include a fabulous museum of Cocteau's art and film work in nearby Menton. Superb French and Italian restaurants down by the ocean and throughout the area. Julia, our gracious host, was available by phone or email to answer any questions we had. It was difficult to leave the stunning view and we would definately rent again. Imagine yourself dreaming in deep, peaceful slumber..
… from a fragrant lemon tree nestled in the cool, lulling gardens below, a gentle songbird sings into your reverie, reminding you that you are not actually dreaming..
.. as your breath unravels your awakened state, you realize that what you took for dreaming is actually your senses having become spellbound, having fallen in sweet surrender to the surrounding serenity of fresh air, expansive sea vistas and the natural silence of tranquility.. It takes time to absorb oneself here, but the effect is immediate. Views from all its wide windows gaze to sweeping panoramic seascape – particularly from the terrace – taking our breath away every time we laid our eyes upon it..
.. whether sipping morning coffee* on the outdoor terrace steps or in soft breezes of the willowy garden in bloom, watching butterflies and resting eyes on nearby towns jutting out to sea, or sipping wine under graceful swirls of pastel skies at sunset as neighboring villages slowly turn on their lights to the coming night, a bejewelled necklace lacing the area far and wide, spellbound were we. Many an evening was spent on the terrace, taking in the full moon’s mesmerizing shimmer on inky sea below, dotted with twinkling nocturnal boats. The salt-shaken dark sky above sparkled with contemplation.. The senses are so preoccupied by beauty and peacefulness that submitting to the captivating views and nature’s alluring calm is not only enrapturing but also unforgettable. The experience quietly lodges itself into memory, making warm beds in our hearts. Il Valico has everything and much more one could expect. It has the comfortable coziness of a rustic farmhouse, a lovely balance of modern functionality and home-style amenities with Medieval history grounded in the foundational presence of this place, books galore in a beloved library (TV & DVD player, too), thoughtful tableware and settings, snug bedding and bath you could easily imagine as In your own home. To be sure, the entire household feels like home - from using the handy laundry room to watching movies or reading good books after enjoying incredible homemade meals. The kitchen has everything an enthusiastic chef could want and with neighboring Latte’s wonderfully stocked Italian market, Ventimiglia, and nearby Menton with its French options, puttering over the stove with authentic ingredients is immensely fun. Good restaurants are also within reasonable reach if the mood strikes. Must have car. Must have very tiny car. The passage to Julia’s Il Valico is so narrow, it’s a thrill to gingerly get through even with tiniest of cars. Take it slow, slow, slow. Expect giddy laughter going through it the first time - and very possibly every time thereafter. The stilling calm that greeted us the first day we stepped into Il Valico embraced like an old friend as we departed. It’s been a number of months now since we discovered this Mediterranean pearl, but memories linger like only lifetime memories do. It has profound and lasting effects, the goodness of this place. Will dream in the meantime.. Until a songbird sings from a citrus tree below and reminds us to breathe again..
* Nespresso coffee & milk frothing machine – Julia does not mess around! Remember to bring your own capsules. M&B, Abu Dhabi. September 2016. "We just returned from a two week stay at Il Valico, and it was spectacular. Pictures do not do it justice. The view of the sea and sky changes constantly, and light just pours through the big windows. The well-equipped kitchen is a big plus for cooks, and excellent produce, charcuterie, olives, and cheeses are readily available in nearby markets. Though we ate every meal on the terrace (in September) the lovely Library provides a perfect place for dessert and a limoncello after dinner. Great privacy for 2 couples, with the apartment below. Be sure to heed the owner’s advice about a car! You must have one, and it must be small to fit through the narrow passages near the house. The place is a dream." 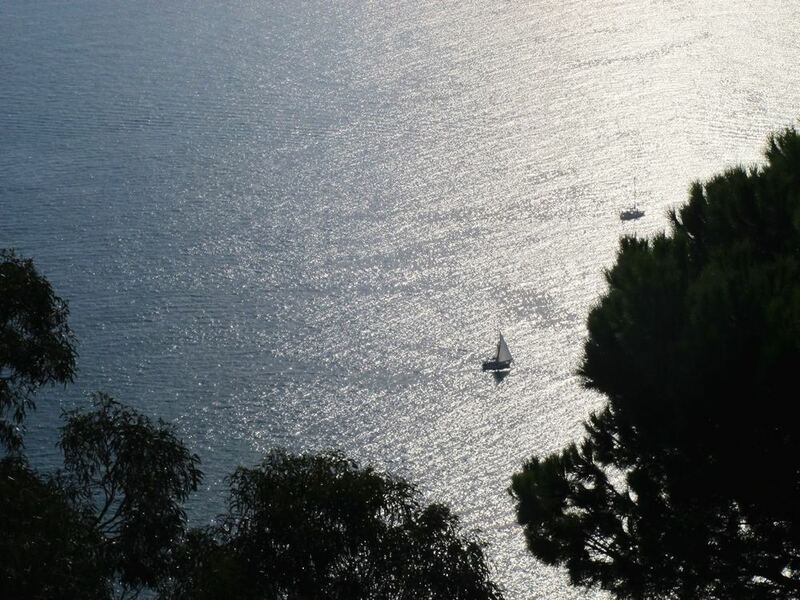 A lovely stay in a delightful apartment with stunning views over the sea towards Menton. The best equipped ever with nothing overlooked. Everything you could possibly think of is provided. Our third time in Grimaldi felt like coming home! We were so excited to see the house and beautiful garden again - couldn’t wait to have the fantastic view from the terrace. By now we have our rituals. First action every day: having a cup of tea on the steps of the terrace. Then visiting one of the food markets - in Menton for the French products and Ventimiglia for the Italian specialities. It’s wonderful. By now we know the area very well and went to Aix-en-provence. A charming town with lots of cafes, restaurants and beautiful places. Our highlight was the visit of Cap Moderne, Eileen Gray’s villa E-1027, Le Corbusier Cabanon and the restaurant Etoile de Mer. There are some more things left we would like to do - reason enough to come back! We love Grimaldi. "I returned to Paradise. At least, that is what I told my friends and family. Having had the opportunity to come to Grimaldi in September, 2015, I was anxious to return this June with my own family. I couldn't wait to see and hear their amazed faces and gasps of pure joy at the sight of the Mediterranean coast from the terrace. I was not disappointed. This place is extraordinary. From the beautiful furnishings and appointments, to the well stocked library and a refrigerator full of all the basics, we couldn't have been more pleased. The apartment is also immaculately maintained. Jeanette quickly took care of a small issue with the tv (our fault). This place is a dream." When considering what I should write in a review of my family’s week spent at the villa, I looked at previous visitor reviews. It seems that they also found it a perfect place for their holiday. Jeanette greeted us with a warm smile . As the hour was almost midnight we greatly appreciated such a warm welcome. The villa is both beautiful and equipped with everything one could possibly need. The library a welcome bonus. For me the early morning view from the balcony was magnificent, made even more special with the fragrance of jasmine. In the evening, sitting outside with our glass of wine we were serenaded by the frogs and crickets...wonderful. I certainly hope to re-visit very soon. "This was our second visit in 18 months, yet it seemed we had never been away. I had thought it was the house I loved. Then I thought it was the garden. Now I realise it is both because they complement each other so sympathetically. Why? Because it’s a team thing: the cheerful, willing back-up. Money can’t buy that. In winter, when it’s grey and cold, I think of Il Valico to cheer myself up. I go there a hundred times at least, so often – especially at night when sleep will not come. There are not many places like that, where you leave a part of yourself and hope to return to reclaim it. F.T. , UK May 2016"
"A five-star villa in a five-star location. Our family of 5 spent a month at this lovely villa in February and we had a fabulous time. The weather was sunny and warm most of the time, with the few odd showers, and we had breakfast and lunch on the balcony many times. The view over Menton and Monaco is incredible and mesmerising and the sun reflects off the sea, giving a lot of warmth to the balcony. We spent hours just admiring the location while sipping orange juice made from windfalls off Julia’s citrus trees. The gardens have 5 terraces and are well tended with a wide variety of plants and places to sit and relax. The house was bigger than we thought and arranged in such a way that everyone could find their own corner in which to read, or sit together for dinner or to watch the large TV (with UK SKY satellite, including sports and movies). The bedrooms are lovely and comfortable with great bathrooms and the annex beneath the balcony was ideal for our son and daughter in law. The kitchen is not huge but we found it well equipped and cooked for 5 many times with no problems. The fridge and dishwasher are large and the little utility room is fine for washing and drying clothes. In the evenings (it was February after all) we needed some heating but the villa has plenty of options for keeping warm.The decor is stylish, with original artworks, and the seating comfortable throughout. You certainly need a small car if you intend to go and I would recommend a Toyota Aygo or Fiat 500 if you wish to navigate the tunnels in Grimaldi without worrying about scratching the vehicle. We had a Citroen C3 which was fine but we had to take two of the four tunnels slowly with about 3 inches to spare on each side. The parking is by the villa and easy. There are no shops in the village and so you need to drive down the hill to Latte on the Italian side (Conad supermarket) or Menton on the French side. Just behind the villa is a long distance footpath which we walked several times. There are incredible views from this path and an interesting deserted village. If you continue up the path, through the deserted houses, you come to a little village with Taverna and church and good views towards Ventimiglia. We were staying during the Menton Lemon Festival and this is well worth a visit. We attended the nighttime parade which was astonishing with very creative floats and happy performers. Menton and Menton Garavan (near to the villa) have fine restaurants. We also parked near the Menton Garavan station and took trains to Ventimiglia and Nice - cheap and easy with wonderful sea views. Parking can be a bit tricky in Menton but there are lots of spaces beside the Super U supermarket in Garavan and it is only a short walk into town along the shore. Jeannette greets you on arrival and speaks many languages. She also lives up the road in case of problems. The cleaner pops in a couple of times a week and does a fine job. We highly recommend this villa and location - we have never stayed anywhere so quiet and relaxing with such a great view. We intend to return. GC and family. UK. February 2016"
When you follow the strada nazionale up the hill to Grimaldi you feel you’re going to a special place .. and you are. You will find a lovely house perfectly situated, secluded by trees to the rear, and through the door you will find a delightful house with very interesting architecture, much light, spacious, and above all exquisitely stupendous views over Menton and the coast beyond and to your left the seemingly endless mediterranean. The terrace is like a filmset specially arranged on that spot. Sitting there and having your drinks and meals is a wonderful experience. The rooms are all very spacious and comfortable, nicely decorated. The kitchen pristine and well-equipped. The garden is very well tended with many special plants and a lemon tree which gives you the best lemons I have ever tasted: a great place for a stroll at the end of the day. Il Valico is ideally located for daily visits to Menton and the Italian villages along the coast, where you can stop for a dive in the big blue. We spent an absolutely great time there and we highly recommend a visit. Having seen Il Valico advertised in the RHS Garden magazine, we decided it would be an ideal place from which to explore the area around Menton and Nice. Right decision! The house enjoys a fabulous situation above Menton and the view from the house and terrace is mesmerising. The information we received about the house prior to our arrival was excellent and directions were clear. We were met by Jeannette’s daughter and her two lovely children. If you are brave enough to tangle with the ‘tunnels/archways’ you can park right outside the house. As we were in a hired car we decided to leave the car in the village, near the church. We had been warned! The house is beautifully appointed, with a well equipped kitchen, stunning views from the dining room and television room (fabulous large TV) and a lovely garden which was already beginning to bloom with all sorts of interesting shrubs. The garden just seems to go on and on and there is a lovely terrace with (aforementioned) fabulous views. Wi-fi in the house works very well. We chose to visit the area in February in order to see the Lemon Festival in Menton and the Bataille de Fleurs in Nice, part of the carnival. We also were able to visit the Violet Festival in Tourettes-sur-Loup, which is a delightful little village. We had hoped to go to the Mimosa festival in Mandelieu but the rain was torrential and I doubt if the parade would have taken place. Undeterred, we drove through the valley with hundreds of mimosa trees and even through the rain it was spectacular. After the first day the weather was warm and sunny. There are lots of lovely gardens to visit, from la Mortola which is just along the road, to the Serre de la Madone (in need of a little tlc but charming) and the Rothschild Jardins Ephrussi (no expense spared!) There are many other gardens well worth visiting and some which we have kept for next time. We enjoyed exploring Menton; the market , the church and the restaurants. Il Valico is a fabulous place for a holiday, at any time of year, I should imagine, although summer might be very busy on some of the roads. What a fantastic setting and delightful home! One is always a little anxious prior to arrival in case the photos and description don’t match the reality but Julia’s absolutely captured the essence and charm of this wonderful holiday home. Yes, the road and arches are challenging but you soon get used to negotiating these and they assist in creating this idyllic environment. You have peace and quiet up there and when you want to dip into any activity, you are 5-10 minutes from Menton or Latte. The supermarket in Latte has fabulous salami, hams, prosciutto etc. and the freshly made pasta is to die for! We found it so hard to leave and were often just content to sit out on the terrace drinking in the vista and wondering how amazing it would be to live in such a paradise. Any enquiries we had were answered immediately and it was very clear that nothing would be a problem. Julia and Jeannette’s attitudes were reassuring and exemplary. We already planning when we can return next year! Thanks for being such a great host! “We were charmed – by the house, by the garden, by the views, by the friendly welcome, by your excellent library and by Menton. We did most assuredly have an excellent time and settled in very quickly, and eventually managed to drive through the final two arches with considerably greater speed than the first few times! Your home is delightful, very well equipped and comfortable. Menton was charming with friendly and helpful locals. We loved the mixture of French and Italian –Ventimiglia felt so different. We went to Nice twice, firstly by bus. Because of work on tunnels it took a long time to get through Monaco so the second time we used the train which was fine. We also used the tram. We both thought the public transport good. We used several of the beaches you recommended, swimming on each occasion. We found the garden fascinating and only wonder how you and Teresio keep it as well as it looked (to us). I could probably go on waxing lyrical but I think you can tell we had a lovely time. Thank you. We had a wonderful week - just about perfect. What an incredible house with such amazing views! Even the art on the walls provided an amazing view! It was a perfect combination of beautiful and comfortable. It was hard to leave to explore the area because we couldn’t imagine a more perfect spot. Of course, we went to the beach every day and did do some exploring of the area but were always so happy to get back to Grimaldi. The house had just about everything one could need - even perfect beach toys. The kitchen was extremely well equipped and well-stocked. Every room was beautiful and the beds were extremely comfortable. My wife and I spent a week with our daughter and son-in-law at Julia’s garden flat in Grimaldi Superiore during the month of May, 2014. The flat was superb and exceeded our expectations. It was fully equipped with everything we needed and was so comfortable. What a delight! The kitchen was complete in every respect and the beds were great. Attention had been given to every detail and quality was shone throughout. Our daughter and son-in-law stayed in the separate guest suite which has its own garden, small kitchenette and bathroom - and they were very pleased. The view of the Mediterranean from virtually the entire property was fantastic with its view of Menton immediately to the west and Monte Carlo just beyond. Because of my job we have lived both short and long term in many rented properties all over the world. From an island with only one other house in the Carribean to a converted fisherman’s hut in Malta. We have never walked into a property and experienced a feeling of ‘coming home’ as we do in Il Valico. We’ve had two visits, in Winter and in Spring and we plan to fit in the other two seasons when we can. Everything about the house resonates with us. The books in the library, the 400tpi percale cotton bed linen, the sharp knives in the kitchen and of course, all the time , the views.